When Carolina Water Damage Restoration came to the Dibraco Agency, they didn’t have a website, URL or even a working company name. They had registered as an LLC with a name that wasn’t necessarily going to help with their digital marketing initiatives. 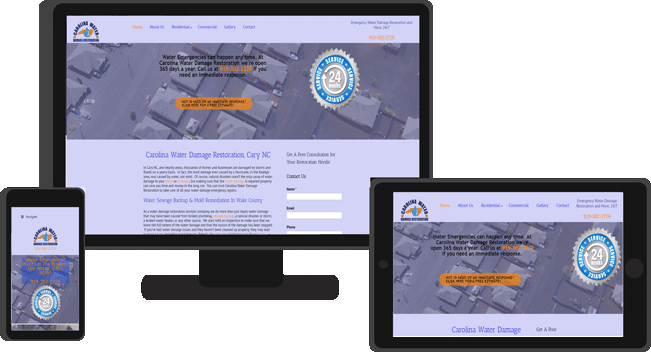 The needs were fairly simple, the owner of Carolina Water Damage Restoration wanted to make sure that they would have a nice looking website, a mobile solution, and the ability to be found online. After talking to one or two other agencies, we sat down and had our initial consultation. Without charging a dime, we helped Carolina Water Damage come up with a URL and a name that reflected the work that they did. We found out a little more about their company, and rather than talk about other services that are normally part of their industry, such as fire damage, we decided to focus on the niche of water damage. After coming up with a content strategy, we decided it was a good time to start working together. The site was completed in less than the 90 day span and less than 2 weeks after being launched, they were found by a customer looking for a different company offering their services. They called the number and decided to sign with Carolina Water Damage. The total amount of the services rendered (they uncovered a separate project) wound up being over 5 times the initial investment for the website. The relationship between our two companies continues. We continue to host and maintain the website and have submitted strategies, at no cost, to help increase visitors to the site. We will continue our partnership for the foreseeable future and will continue our digital marketing initiatives as our partnership continues to grow.